The year was 1979, and it was a cold and short winter day. Sunset would fall at 4:25 and there was much to do before then. Three boys had arrived at the hospital early in the morning to take blood tests. At one o’clock, when they were in the operating room and scheduled to begin the procedure, the nurse entered and informed them that their vials had been misplaced. They submitted to another round of blood tests, waiting for the results to make sure they were cleared for the operation. Once everything was in place and the doctor was ready, the mohel realized that there might not be time for all three boys to have their brissim before sunset. The doctor and parents were in a quandary. The boys had spent the entire day preparing and now it was probable that at least one of them would have to wait until the following day. The Russian boys, 9, 11, and 14 and not yet observant, were newly steeped in their Jewish heritage and ready, but as nightfall approached, their Jewish strength would be tested. Entirely on their own and to the utter astonishment of the adults in the room, the boys conducted a raffle to determine who would have the privilege of going first. Despite having grown up in a country that sought to eradicate their religion and having little understanding of Jewish observance, these three boys were so inspired by their recent learning, so impassioned by the spark of yiddishkeit within, that they vied for the earliest opportunity to truly become part of the Jewish people. 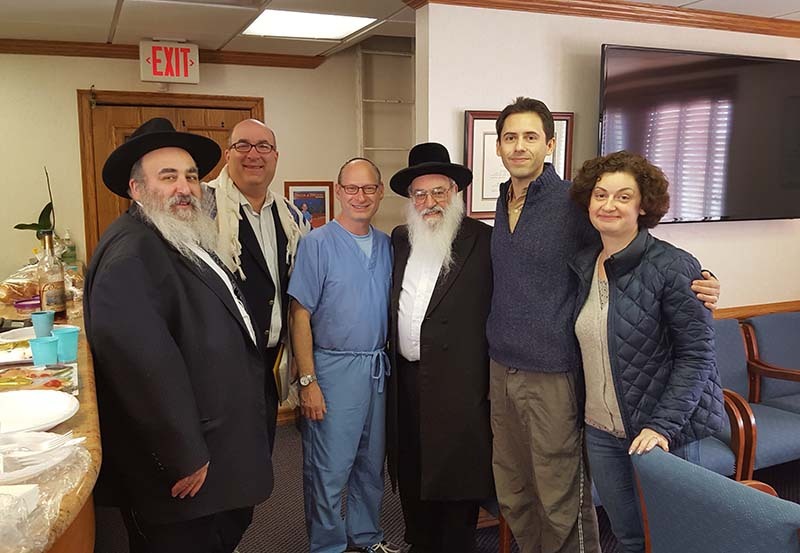 For Rabbi Kanelsky and the Bris Avrohom organization, which is devoted to helping Russian Jews reclaim their Judaism, performing ritual circumcisions are part and parcel of daily life. He has arranged more than 6,500 brissim for Russian immigrants, and while each one is meaningful, there are some that he will never forget. The story of these special boys is one of them. Since then, Bris Avrohom has reached scores of Russian immigrants and their families through their centers in Hillside/Elizabeth, Jersey City, and Fair Lawn. Their state of the art Bat Sheva Chaya Esther Mikvah draws men and women from near and far to immerse in its waters, many for the first time. Adult education classes are available in three locations throughout New Jersey, where Russian Jews learn about yiddishkeit. The Kanelskys and their associates have given hundreds of bar mitzvah lessons, and planned countless bar and bat mitzvah celebrations here and in Israel. Back in the former Soviet Union, where speaking of performing a bris was criminal, staging one was nearly impossible. So here, in the United States, where he is permitted to discuss and act upon his religious convictions, Rabbi Kanelsky went to work finding boys and men who were ready to embrace their newfound faith. For some, it was a difficult decision; for others, like these boys, it was their chance to become Jewish to the core. Rabbi Kanelsky’s outreach doesn’t simply touch individuals; it impacts generations. One day in 1981, as he was driving, he saw a kid being bullied on the streets of Jersey City. Lowering the window, he yelled, “Are you Jewish?” The boy said yes and Rabbi Kanelsky told him to jump into his car. As the car sped off, they spoke, and the rabbi learned that the boy was a Russian Jew studying in public school because his parents couldn’t afford to send him to private school. Rabbi Kanelsky immediately enrolled him in the Jewish high school. Two weeks later, when the school requested some tuition from the boy’s family, the mother arrived at school with a bag containing all she could afford to contribute for the month: ten dollars, paid out in nickels, dimes, and quarters. Some time later, the boy got into trouble, and after a second warning, the principal threw him out. Despite being expelled, the boy expressed his gratitude to Rabbi Kanelsky for the opportunity, however brief, to attend a Jewish school. During those months, he learned about his heritage. Now an adult, his children have all had brissim and bar/bat mitzvahs. When his third son was about to turn 13, the boy wrote a letter to the Lubavitcher Rebbe asking for a blessing. When Rabbi Kanelsky asked the boy what blessing he requested, he was gratified to hear that the boy had made a personal commitment to don tefillin daily, and had asked the Rebbe for a blessing that this mitzvah should never prove to be a struggle. When Rabbi Kanelsky asked why he was committing to tefillin, the boy answered that he saw how important the commandment was to his father, and that no matter what the situation, his father always made sure to put them on. One time, he remembered, his father flew out to Florida for a meeting and forgot his tefillin at home. Troubled, he called Rabbi Kanelsky with an emergency request. He needed the rabbi to find someone who could bring him tefillin. Never one to turn down an opportunity for a mitzvah, Rabbi Kanelsky located a Chabad rabbi 50 miles away who drove a set of tefillin to the man. This is how Rabbi Kanelsky makes a difference. His impact on one young boy changed a generation of Jewish souls. Locating unaffiliated Jews and performing brissim has been a herculean task, but largely one conducted quietly and privately. Rabbi Kanelsky, with his booming voice and outspoken way, also strives to strengthen Jewish identity and pride whenever and wherever possible. And when he received a pivotal letter from the Lubavitcher Rebbe about this very idea, he immediately took the message to heart. Before Chanukah of 1989, the Rebbe sent Rabbi Kanelsky a letter stressing the importance of lighting Chanukah candles and of publicizing the miracle. He underscored the idea that even if it is dark outside, just one candle can light up the night. The same, he believed, is true of the spirit of a Jew. You can rekindle the soul of a Jew, even in the darkest of times. The Rebbe implored that it was crucial to publicize the Chanukah miracle via the light of the menorah. Rabbi Kanelsky dreams big and his next project, based on the Rebbe’s Chanukah message, was big. His goal was to put enormous menorahs, visible to passersby near and far, in all the most popular public crossings and locations throughout New York and New Jersey. Those menorahs that you see when you and 700,000 others drive over the George Washington Bridge? The giant menorah in front of the Lincoln Tunnel that 320,000 viewers pass on a daily basis? The ones at Port Authority, Penn Station, and the Goethals Bridge? The one you spot when you arrive at JFK or Newark Airport and when you visit the Jersey Gardens or Newport Mall? Those menorahs didn’t just show up one day. Their appearance was the culmination of a multi-year effort by Bris Avrohom. One of the last mitzvos that Rebbetzin Chaya Esther Zaltzman OB”M, Mrs. Shterney Kanelsky’s mother, performed before she passed away was visiting a politician’s office and affixing a mezuzah to his doorpost. After she died in a tragic car accident on the eve of Yom Kippur in 2004, he came to pay a shiva call and wanted to make a donation in her memory, in appreciation for what she did for him. Over the next five years, Bris Avrohom made headway, but still, no menorahs had been erected. With this politician’s help, Rabbi Kanelsky forged connections with people of note. But it was not until his five minute meeting with the director of Port Authority that he knew his goal was in sight. That was eight years ago. Since then, Bris Avrohom has placed a record number of menorahs in almost every densely populated location in our area. In total, there are 125 huge menorahs which are seen on a daily basis by 25 million people every year at Chanukah time.